I'm a writing, dancing, running, tweeting, pinning, traveling, crafting, baking, working MOMMY who is all about trying new things. My family and I live on Long Island and love to travel. JD and O work as models, so we spend a lot of time in NYC. I try not to spend ALL my free time on Pinterest, and I frequently get in over my head when I attempt any of that stuff. 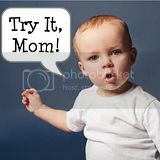 Here at Try It, Mom!, I write about my struggles & triumphs as a single mom navigating divorce with two small children, new beginnings, tips, my favorite things & the things that totally annoy me, the good days, bad days, & the "Is there a camera hidden somewhere?" days. I returned to my job as an English Language Arts teacher after staying home with my boys for three years. I am a huge nerd about literature, and as I write this, I am sitting in Monterey Square pretending I am John Berendt. Ideas for my next big adventure, an epic Hemingway tour through Spain, have been collecting on my desk for years, and I can't wait to get there.